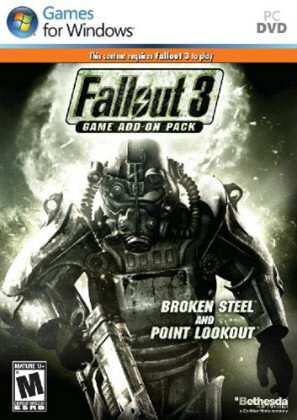 Point Lookout is the fourth out of five (and perhaps counting) DLC packs for Fallout 3. It's a departure from the previous DLC packs in that it isn't dominated by a main campaign; it's sort of like the capital wasteland in miniature -- open ended, with lots of places to go and quests to complete, and where you can do most things in any order or skip them altogether if you want to. That sounds good, but I found myself not really enjoying the new content, and I'm not sure if it's the DLC itself that I didn't like, or if I've just gotten to the point where I'm worn out on Fallout 3. The DLC takes place on a swampy island somewhere off the coast of Maryland. Part of the island is taken up by a derelict boardwalk (complete with a lighthouse and a ferris wheel) and the other part is where the locals live (complete with inhabitants who look like they're from a movie where teenagers get cannibalized or worse). You're introduced to the island by a ferryman who advertises it as the perfect place for (any mercenary, treasure hunter, or adventurer) -- that is, you -- but of course the ferryman has his own agenda, as you discover as you play through the DLC. Point Lookout has dozens of places to visit, including decaying manor houses, a bank, and some cave systems, but they're all on the small side, and they don't take long to explore. There are also ten quests available, but they're on the small side as well, and the whole DLC only takes about five hours to complete. That was a problem for me because nothing in the DLC gave me any sense of accomplishment. The encounters and quests were over before I could get into them. As an example, at one point a guy asks you to find a book. Well, to claim the book you only have to kill about five enemies in one small basement, which takes about five minutes. If you then return the book to the guy, that's it, quest over. But in one of exactly two places in the DLC where you actually get to make a decision, you can also choose to destroy the book. For that case you have to visit the Dunwich Building in the capital wasteland, and, in amazingly great contrast, the Dunwich Building is about five times larger and five times more interesting than anything in the DLC, and it puts all of the new content to shame. If I'm working for Bethesda, I don't make that sort of contrast so easy to notice. I also didn't especially like the combat in the DLC. Most of the inhabitants of the swamp are humans wearing overalls, but you still have to empty a full clip into their head to kill them (this is essentially the same as with the Enclave soldiers in Broken Steel, but at least the Enclave soldiers had power armor, so they were more believable). The enemies also use crappy weapons like double-barrel shotguns and shovels, weapons that I'd never, ever use, but they manage to do a lot of damage with them. That means every fight wears down your equipment, but you never find anything to repair it with, and so you have to play through the entire DLC with your gear at half capacity or worse, which isn't a lot of fun. On the plus side, the island and its swamp look pretty good, and the DLC consistently maintains a creepy atmosphere, complete with a few nods to the Blair Witch Project. There is also a nice sequence where you can get the island's lighthouse working again, and convert it into a shining beacon in an otherwise drab and murky green world. But the graphics aren't enough to make up for the inconsequential quests and the annoying combat, and so Point Lookout is an iffy DLC for me. I'd only recommend it to fans of Fallout 3 who probably rushed off to buy it before I even wrote this review.